Uggie, the Jack Russell star of The Artist, will not make an appearance at the Academy Awards next week, the film's distributor has announced. A spokesperson for The Weinstein Company said the 10-year-old terrier had "not been asked to participate or appear at the Oscars" on 26 February. The announcement contradicted earlier reports that Uggie had been rehearsing a sketch with host Billy Crystal. The canine performer "retired" after completing his role in The Artist. But he has continued to make public appearances in the run-up to the Oscars, where his film is in contention for 10 awards. On Monday he was named best dog in a theatrical film at the Golden Collar awards, a new ceremony recognising Hollywood canines and their trainers. The accolade followed the Palm Dog accolade he received at last year's Cannes Film Festival, where The Artist had its world premiere. 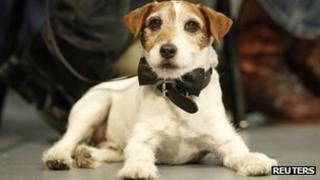 Uggie plays Jack in the French-made film, a celebration of black-and-white silent cinema. It is tipped to win several prizes at next week's Oscars following the seven awards it took home from the Baftas on Sunday.